You may have recently heard about the 'no poo' craze sweeping the internet. This is the simple act of using non-shampoo products as part of your hair washing and care routine. Perhaps the most popular of all natural shampoo alternatives is apple cider vinegar. 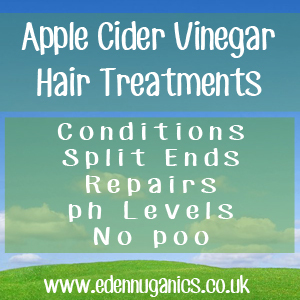 ACV is an age old health tonic, packed full of natural acids and enzymes that help to strip back unwanted product build up and remove residues from your hair. Although any apple cider vinegar will leave your hair looking great, for maximum shine, we recommend using raw, unfiltered apple cider vinegar containing the mother. The enzymes, living bacteria and nutrients found in this unprocessed variety help to moisturise hair follicles and repair split ends. Empty spray bottle - this will be used to apply the apple cider vinegar to your hair. Baking soda - This helps to restore the pH levels of your hair. How to use Apple Cider Vinegar for your hair. There are a number of different ways in which ACV can be used but perhaps the most popular preparation is to add half a cup of apple cider vinegar to 16 ounces of water. If you want to take things a step further, essential oils can be added at this point to help reduce the smell of the vinegar. The first step is to get your hair wet and apply around a heaped tablespoon of baking soda. Massage this into your hair and scalp being sure to work it down to the roots. Next, rinse this mixture from your hair, being sure to remove all of it. Using our ACV spray bottle, work the vinegar through your hair being sure to give all of it an even coating. Allow the mixture to sit on your hair for around 5 minutes before rinsing off. How often to use ACV on my hair? This is far from an exact science but if used everyday, apple cider vinegar can have a slightly drying effect on your hair. We recommend using this hair rinse twice a week to keep your hair healthy, soft and shiny. Our hair, in its natural state, is mildly acidic, in fact it has a very similar pH level to raw apple cider vinegar. Many of the shampoos and conditioners we use on our hair are highly alkaline and can dry our scalp and lead to split ends. Rinsing regularly with ACV will help to remove unwanted product build up and balance the pH levels of your hair and scalp. Another way Cider Vinegar makes your hair look silky smooth can be found in its ability to close broken cuticles along hair shafts, resulting in lush looking locks that reflect the light. Not many people like the smell of vinegar. It's just one of those aromas that lingers on anything it comes into contact with. This is often one of the main reasons why people are put off the idea of including apple cider vinegar in their hair care routine. Essential oils are a great way of masking this issue and they can even offer their own unique range of benefits. Which oils can be used? Lavender is an amazingly versatile essential oil that not only helps to hydrate and moisturise your hair, but is also an excellent natural treatment for dandruff. Lemon - Tired of dry, dull, lifeless hair? Lemon oil is known to stimulate oil glands within our hair follicles leading to stronger looking, shinier hair. Rose - Rose oil is another great oil for use on our hair. Highly moisturising, rose oil has proven beneficial to people suffering from psoriasis and other scalp conditions. Rosemary - Trying to get longer hair? This amazing oil is known to reduce split ends and promote hair growth. Sage - Sage and apple cider vinegar work in combination as a powerful topical treatment for hair loss.